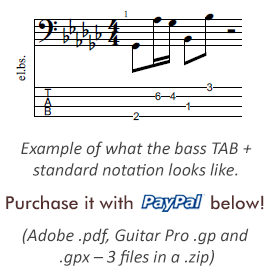 Here’s a makossa bass tutorial, all you need to do is click the button below and download the tablature! You can practice & play it with any kind of picking and plucking style; I played it my own way, with a thumb pick and 3 fingerpicks. It’s fun! -.- Makossa is a Cameroonian genre; it’s basically their version of afro-pop. And this time, it’s not restricted to a kind of African rumba; makossa can be many things, from funk to jazz and anything in between. Our current tune is kind of funky, but with a touch of that characteristic African vibe you can’t mistake for anything else. The bass line has two parts, the 2nd one is played higher up the neck. Both parts have the chord structure of I-IV-V. The piece is in the key of B. Let’s move on to how to approach this beast! The beginning part of our makossa bass line is mostly made of these staccato notes. You need to place/play these right in the pocket, accurately. It’s probably a bit easier to do if you play regular fingerstyle, because of how your fingers naturally work as string mutes. Playing the thumbpick/fingerpicks style, it’s more of a challenge, but it’s manageable. Use your palm, use your fretting fingers and you can even use your picks every now and then, to stop the strings from ringing. While the piece starts with an octave leap, most of it is 16th notes, with a couple of rests of course. The above mentioned muting or string blocking is the most needed when you play the three consecutive notes on the open E string. Other than the muting, you won’t run into many problems while practicing the 1st section. The second section starts with a figure that’s intended to turn heads, in spite of its relative simplicity. Starting from the tonic, you’re required to play a 5th on top of it, but right after it, you need to jump below the starting note one octave, all in quick succession. It, however, is not the difficult part. That comes right after this octave. Simply because you have to play a lot of notes and find a way for your fingers to get where needed in time. Landing the little finger of your fretting hand on the E string right after the note you played on the D string will take some slow and accurate practice. This melodic bass line follow the chord changes rather closely, you’ll have plenty of fun playing it.